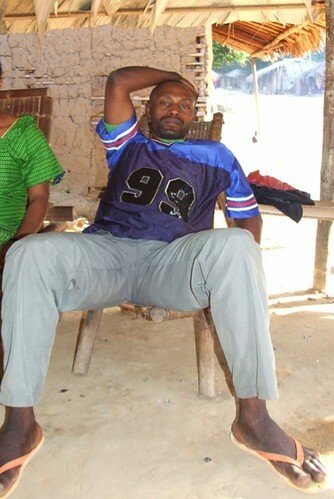 “Ranger is in Litoko.” The message came from Louison, our camp leader at Bangaliwa. It was the second week of September, 2016. 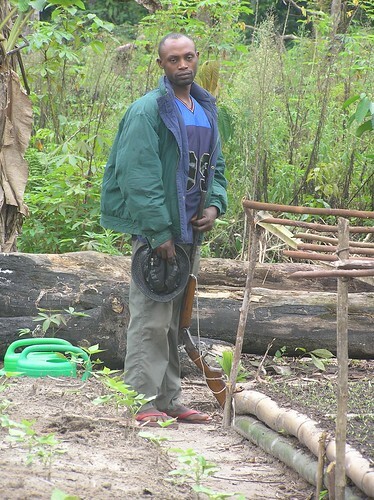 Ranger with shotgun in the gardens of Obenge – 2009. Had Ranger Lavino come back? Ranger is the head of an elephant poaching gang. Unlike Thoms who is flamboyantly evil , Ranger is cold, calculating and very slippery. Our camp at Bangaliwa and villages where Ranger has been seen in 2016. The map shows the northern park and bufferzone. In early 2016 Ranger fled. But not until after his military suppliers were put on public trial and convicted, and two of his gang were shot dead in a confrontation with the military. We heard he went south to his original village in Sankuru Province. Good riddance. More than 50 elephants were killed south of Opala in 2015, his gang responsible for more than 3/4 of the deaths, but at least he fled. In 2015 there were three elephant poaching gangs operating around the northern Lomami National Park: Ranger’s, Tchuma’s and Thoms’s. Ranger’s gang was responsible for the most killings. 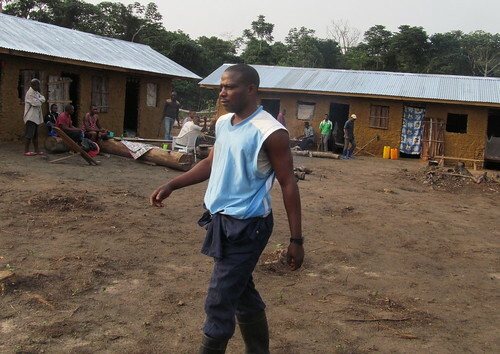 In September, when Louison sent the SMS, our teams were spread out in the field. We were doing an elephant census, the first since 2012. The park is quiet; the 2015 slaughter took down an elephant population between the park and Opala. We felt the tragic relief of a family spared by a passing plague. But now Ranger is back and on the edge of the park. 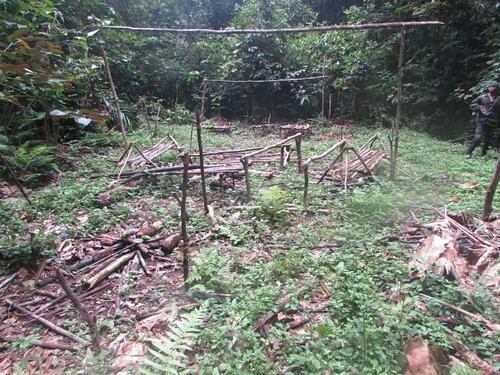 Our teams later came across this poacher’s camp in the park, not far from Obenge. It dated from around September and had Ranger’s markings: he has the only known poaching group that sets up structures for tarps rather than using leaf roofed barazzas. 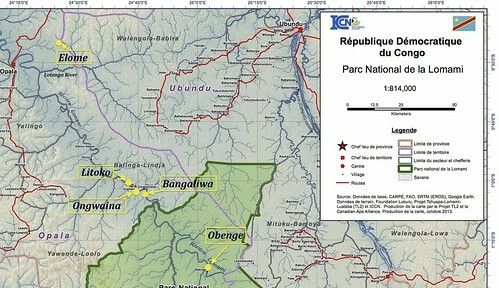 Although the letters did not reach Bangaliwa until later, Obenge send word that Ranger had continued down into the park. It was understood that he was after elephants. The warning came too late. 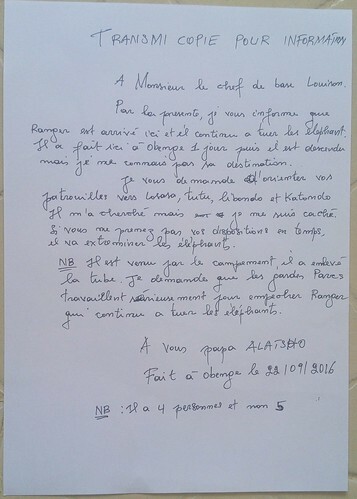 This is a translation of Alatsho’s letter from Lingala to French. In it he warns that Ranger spent a day in Obenge then went into the park to hunt elephants. He warns Louison where he should send surveillance teams — but the warning arrived too late. It was the 28th of September that we got a second satellite phone message from Louison. Ranger’s pirogue had sunk. He was heading north, away from the Park when, in the predawn, about 3 AM of the 27th his dugout struck a submerged tree and overturned. Ario the chief from Ongwaina village brought the information to Bangaliwa. It had been just in front of his village. Ranger came up dripping and furious. He said there were four elephant tusks in the boat and sacks of elephant meat. 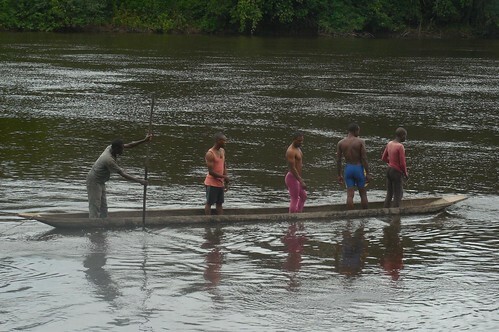 All now on the bottom of the Lomami. Louison at our camp in Bangaliwa. At this time the camp was still under construction. Later Mama Ali who lives in Ongwaina gave her account. At the rooster’s first crow, four men struggled out of the river into the still sleeping village. Ranger had one white plastic sandal on, the other lost. 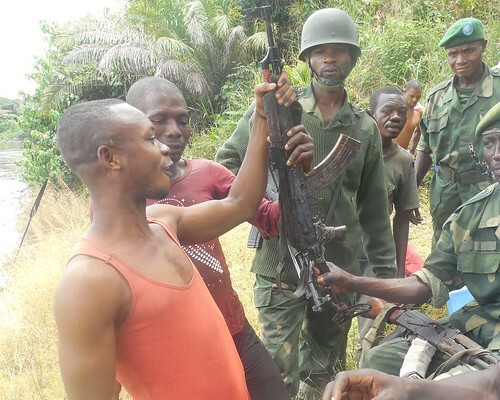 Another, a hunter from the southern province of Maniema, declared his rifle had been lost. 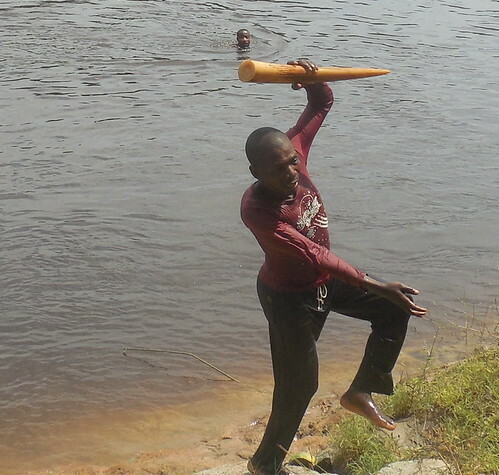 A picture of Ranger when he was based at Obenge in 2009. Ranger warned that if the military came, or if anyone came, and asked where the ivories went under, the person who informed would answer to Ranger, himself. Ranger had passed our Bangaliwa camp at one or two in the morning. The small group of military and park guards we share our camp with, had seen nothing. It was a month later that divers were brought in. We brought them up river from Opala, The Lokele, an ethnic group of river-people, sent five men that could handle the depth and the current. The divers as they prepare to start diving. On the 30th of October they started diving at 9:45. Three pieces of ivory, the equivalent of a tusk and a half were brought up. 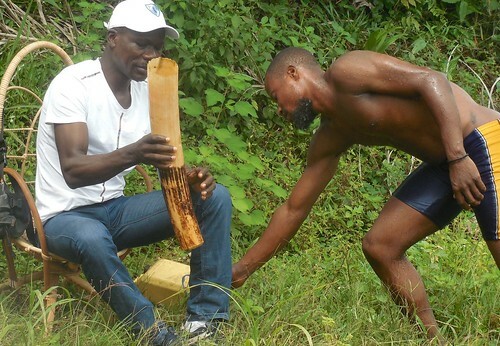 Our team leader, Henri Silegowa, examines the first piece of ivory brought up. A second piece of ivory is hauled out. Also one AK 47 rifle, some cartridges and an old pot. 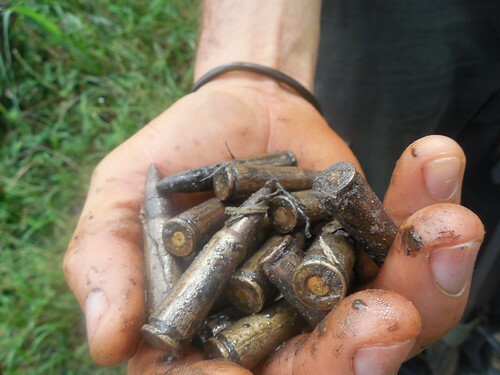 With cartridges – 10 of them. The rifle was given into the keeping of the army; the tusks were given into the keeping of ICCN, the conservation agency. 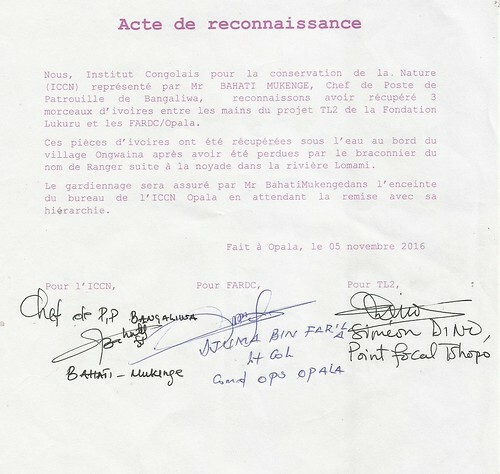 The army, the ICCN and our TL2 coordinator in Kisangani all sign over the ivories to the ICCN’s care in Bangaliwa. But what had become of Ranger? As long as he is uncaught the elephants of the park are not safe. In January through an informant we learned that Ranger had a new military contact for arms and munitions. We learned his village base for getting supplies and evacuating ivory and meat was Elome (see map above), still in the forest, but with easy access to the road to Kisangani. In February through another informant we learned that Ranger was back in the park accompanied by two military and an ex-military. He is in the Tutu basin – the core of the Elephant zone. In a vast wilderness like TL2, a wily and ruthless elephant poacher can do incalculable damage. But there is some good news. This month of March, our PALL (TL2 law-enforcement) operative in the northern buffer zone informed us of the arrest of Tchuma. 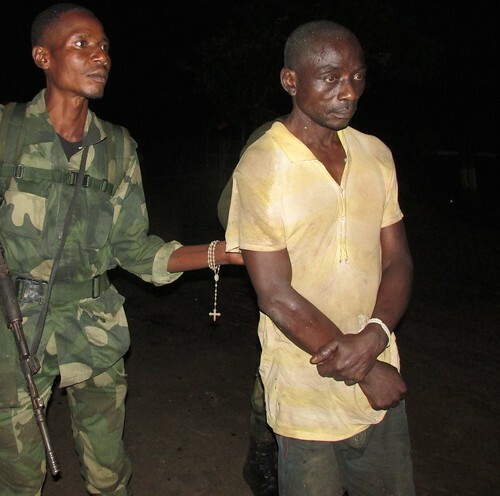 Tchuma arrested in Opala and transferred to Kisangani. This is an important victory. He was one of the key 2015 elephant poachers. His case is now going to trial. (See map above of 2015 elephant killings. Ranger, however, is still out there, and he continues to poach elephants. Perhaps there are no definitive victories, but with more important and more frequent crack-downs, the elephants will become ever safer. This entry was written by Terese Hart, posted on 2017-03-28 at 9:42 pm, filed under Elephant, Law and Order. Bookmark the permalink. Follow any comments here with the RSS feed for this post. Trackbacks are closed, but you can post a comment. Upsetting that Ranger is at large once again, but inspiring to read of Tchuma’s recent arrest. Excellent recovery of the sunken ivory, amazing that it could be recovered from the depths of the Lomami. 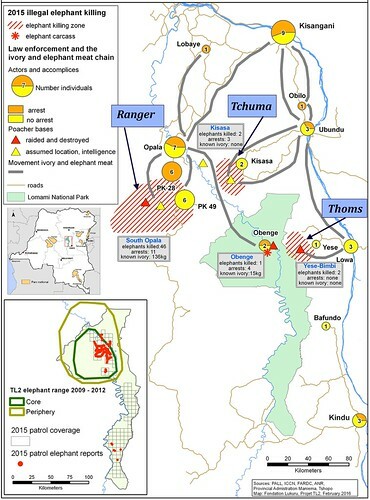 Looking at the map it appears that a lot of elephant sign is showing up in the northern LNP near Obenge, but the majority of poaching is occuring in the periphery. Does it seem that the elephant population within the park is protected from poaching? Or are there sufficient numbers in the buffer zone that poachers haven’t needed to go so far? Great update on the TL2 elephant poaching Terese. Thank you Daniel for your comment. Elephants are indeed concentrated in the park, with few in the bufferzone immediately adjacent. We do not know very much about the elephant population south of Opala that Ranger was poaching. It is well north of the park and beyond the bufferzone. What information we have suggests this population is considerably smaller than in the park, and is localized. It is difficult for Ranger to hunt in the park as it is remote from his supply lines, and there are no settlements he can use as bases. Furthermore he is at risk from patrols. This makes hunting in the park difficult, though he may be able to kill some elephants as we saw in this ivory story. It is important to keep up the patrol effort. We hope for Ranger’s arrest. But in the meantime, the park has to be protected.